At the age of 20, Gianni Masciarelli was helping with the harvest in Champagne. At the age of 26, in 1981, he started making his own wines in the Italian region called Abruzzo. 1984 was the first release of the Villa Gemma Rosso wine, truly a different take on the Montepulciano wines. Montepulciano is the main grape of Abruzzo (not to be confused with Montepulciano in Tuscany, which is the name of the village where the wines are made from Sangiovese grape). Late in the 20th century, Montepulciano d’Abruzzo became one of the most exported Italian wines – it was dry, it was simple, it was quaffable and, of course, good for pizza. 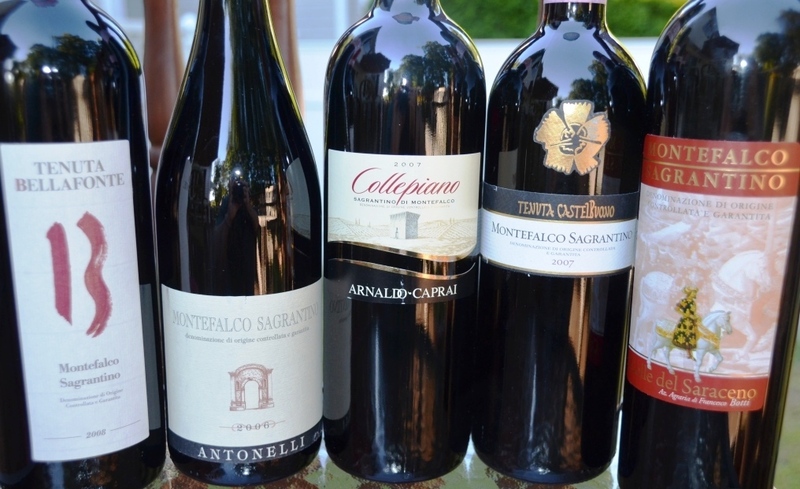 Gianni Masciarelli had his own, pioneer view on how the Montepulciano wines should be made. He introduced Guyot training system for the vines in Abruzzo. He was the first to start using French oak barrels in the production of Montepulciano d’Abruzzo and Trebbiano d’Abruzzo, showing the world that Montepulciano can go way beyond just a “pizza wine” qualities. Today, Masciarelli estates are run by Marina Cvetic Masciarelli, late wife of Gianni Masciarelli; the vineyards spawn 350 acres and produce about 1.1M bottles of wine across 5 different lines. P: soft, generous, round, fresh acidity, touch of leather, cherries and cherry pit, generous tannins on the finish. V: 8, excellent wine, unmistakably Italian, supremely delicious. These wines were absolutely delicious in their own right. I seriously don’t know about pizza – you can probably pair anything with pizza, from two buck chuck to the Screaming Eagle and Petrus – but you really don’t have to. These three wines from Masciarelli Villa Gemma would perfectly complement any dinner – appetizers, salads, and mains – these wines pack a serious amount of pleasure. Don’t take my word for it – try them for yourself. The pizza is entirely optional. Cheers! When it comes to traditions, Italians definitely know how to preserve them. Tour the country, and you will see that finding a 500 years old villa or palace in Italy is very easy; there are plenty of places where the connection can be made through even a 1000 years of history. Italians definitely know how to preserve their traditions. “In the hills of San Martino alla Palma, vineyards and olive groves have been cultivated for more than a 1,000 years. The estate is located not far from the Via Francigena, the route used by crusaders returning from the Holy Land, and as such a point of passage, the location took its name from Saint Martin, patron saint of vintners and grape harvesters, and Palma (Olive tree), the symbol brought home by crusaders as proof of their travels. In the mid-1400s, in the very midst of the Renaissance, the marquises Torrigiani, bankers and wine sellers, bought the land that extends from Castellina all the way to the top of the hill of San Martino alla Palma, thus founding Fattoria Torrigiani (The Torrigiani farm). The marquises Torrigiani called on the renowned Florentine architect Michelozzo who designed the stately Villa Torrigiani, which was constructed from 1470 to 1495. The villa, with its numerous halls frescoed by master Florentine painters, is situated at the center of the farm and looks out over the valley of Florence and the cupola of the Duomo. At the beginning of the 16th century, the farm was divided into 22 “poderi”, or farmsteads, each run by a family group, many of whom have descendants who live in San Martino to this day. The farm was so well organized that it was self-sufficient and no longer dependent on Florence, and consequently, its inhabitants were able to avoid the bubonic plague outbreak of the 1600s. Fattoria San Martino alla Palma covers almost 900 acres, out of which the vineyards take about 115 acres, and about 300 acres dedicated to the olive trees – in addition to wines and grappa, Villa Torrigiani also produces olive oil. Now, the wines produced by Villa Torrigiani are unquestionably modern. Unoaked Chianti, Chardonnay from Tuscany, super-toscan – while the wines are rooted in tradition, it is hard to argue that they also represent modern Italian winemaking. P: fresh, playful, polished, layers of dark fruit, cassis, clean acidity, excellent balance. A true delight. V: 9-, outstanding. I would love to drink this wine every day. Here you are, my friends. A beautiful estate with a very long history, producing excellent wines. The only challenge we have at the moment is finding these wines in the USA – but hopefully this will change soon. Cheers! I’m sure Ferrari wines don’t need long introduction to any oenophile. Giulio Ferrari started eponymous winery in 1902 in the mountainous region in Northern Italy called Trento. He was the first person in Italy to plant substantial quantities Chardonnay, which he personally brought from France, and then started production of the “Classic Method” sparkling wines, inspired by the French Champagne. In 1952, Giulio Ferrari had chosen Bruno Lunelli to become his successor at the winery, and this was the beginning of the second chapter of Ferrari’s history. The rest is, yes, history, and you can read it for yourself here. Q1: Ferrari is considered a symbol of the Italian Art of Living. What this “Italian Art of living” concept includes, how would you define it? A: My family is incredibly proud that Ferrari as a brand is considered a symbol of the Italian Art of Living internationally. Whether it is being served at the Quirinale, home of the President of the Italian Republic, or used to toast celebrated events in the world of fashion, sport, cinema, culture, or design, Ferrari represents that hugely evocative emotional blend of tradition, sense of place, inherent quality, and the poetic virtues of our most cherished way of life. The Italian Art of Living embodies the passion for beauty, taste and elegance; the ability to embrace innovation while respecting traditions; and a zest for life that is the very soul of the Italian spirit. I firmly believe that the success of Italian wine is due to a unique love affair that exists in many countries for our way of life, our food, our rich and unique history, and the traditions of our culture. Beauty and pleasure are mutual to one another and Ferrari wines has joined together with fashion and design brands as ambassadors of the Italian lifestyle. Q2: How is riddling done at Ferrari – still by hand or with use of the machines? A: In the Ferrari winery we still do 1/3 of the riddling by hand, in particular, all the vintage wines and reserves. The rest is done with use of the machines. Q3: Typical “house cuvée” at the Champagne house is a blend which might include about a 100 so called Vin Clairs, still wines coming from different vineyards and vintages. Does Ferrari have similar approach in the production of the non-vintage sparkling wines? A: We do have a similar approach in the production of non-vintage sparkling wines. The biggest work in the vineyards and in the cellar is to keep separate each single homogeneous zone production in order to create the best cuvée. Non-vintage sparkling wine cuvée includes grapes coming from vineyards within the Trentodoc denomination, which means only in Trentino region and it is created with 70/80 different base wines. Moreover vintage sparkling wine is made with grapes coming only from our own vineyards and it is a result of 40/60 diverse base wines of the same year. Q4: Ferrari is promoting sustainable viticulture. Do you have any plans to become all organic, or at least to produce an organic wine? A: One of the core philosophies of the Lunelli Group and Ferrari Winery is the advancement of sustainable practices throughout all our vineyards. We believe that by practicing sustainable farming techniques we not only improve the quality of our wines but protect and preserve our majestic environment and improve significantly the health and safety of our farmers. Indeed we strive to make sustainability a cultural heritage for all of our grape growers. All of the vineyards owned by my family including those of the Ferrari winery and Tenute Lunelli are cultivated according to organic agricultural principles and in the near future they will all be organic. At the moment we are already producing an organic certified red still wine, Aliotto from our estate in Tuscany. Q5: Considering that you share common name with the world famous car manufacturer, did you ever try to create a business relationship with Ferrari the car maker? A: We are glad to share common name with an iconic brand such as Ferrari Maranello and to have a very good relationship with them. We are also proud to have in our photo gallery of famous moments, striking pictures of Grand prix ceremonies celebrated with Ferrari wines. We both work throughout the world in promoting the very best of Made In Italy. Q6: What was your most difficult vintage at Ferrari and why? A: One of the most difficult vintages was 2014 due to a very long and intense rainfall during the growth cycle of the vine which presented a great challenge in vineyard management to ensure healthy grapes for the harvest. It is in a very complex year like 2014 that man, his work and his vision make the difference. Q7: What is the oldest Ferrari wine you have in the cellar? What was the oldest Ferrari wine you tasted? A: The oldest Ferrari wines already disgorged are from the sixties, when Giulio Ferrari and Bruno Lunelli were still working in the winery. The oldest Ferrari, still on the lees, is 1972 vintage, which is also the first vintage of Giulio Ferrari Riserva del Fondatore. I was lucky enough to taste the first vintage of Giulio Ferrari Riserva del Fondatore. It was amazing, well balanced mature notes with an unexpected youth, fruit of our Trentino territory, Trentodoc mountain agriculture which allows for both longevity and youthfulness. Q8: Do you have a favorite vintage of Ferrari wines? A: My favorite vintage is Giulio Ferrari Riserva del Fondatore 1995 for two reasons: first of all because it is considered the vintage of the century where power, elegance, longevity and freshness are combined in one single wine and all these factors are in a perfect and unshakeable balance. Secondly this vintage has a personal affection because I had the good fortune to start to work at Ferrari in 1995. Q9: Do you only use two varieties in the winemaking – Chardonnay and Pinot Noir – or do you use any others, such as Pinot Meunier, for instance? A: We use Chardonnay and Pinot Noir grapes separately for white wine making in order to create all our 100% Chardonnay Ferrari wines and the Ferrari Perlé Nero, our 100% Pinot Noir, blanc de noirs. For our Rosé we use both the grape varieties: Pinot Noir, using the Rose making-process, which gives body and structure to wines and Chardonnay which provides elegance and freshness. Q10: Do you produce or do you have any plans to produce still wines? A: Ferrari Winery creates a remarkable collection of Trentodoc sparkling wines, yet the Lunelli Group also includes a series of elegant and long-lived still wines, under the brand, Tenute Lunelli. This brand embraces wines from three regions, each superbly suited to the production of winemaking grapes: Trentino with its mountain viticulture; Tuscany with the rolling Pisan hills and Umbria which reveals herself in the small, fascinating DOCG of Montefalco. All our still wines are representative of our standards of high quality with the ability to demonstrate the variety of our diverse lands; this is the incredible richness of the Italian wine industry. Respect for the land and sustainability are today common core values in all our brands. Besides the Estates and Ferrari, the Lunelli Group is made up of a distillery, Segnana, a mineral water, Surgiva. Q11: Do you have any favorite Champagne wines, or any sparkling wines for that matter? A: Champagne Bollinger and Cuvée Sir Winston Churchill Pol Roger which embody the characteristics I love in sparkling wines; elegance, refinement and longevity. Q12: When you are not drinking Ferrari wines, what are your favorite wines, from Italy or anywhere in the world? A: When I do not drink Ferrari I drink my favorite red still wines from Sangiovese grapes and Nebbiolo grapes: Brunello di Montalcino and Barolo. When I choose Barolo I always have discussion with my father because he prefers Barbaresco, with less power but more elegance. And we are done here, my friends. I think this was quite fascinating and interesting conversation, adding an interesting detail to what you might already know about Ferrari wines – for sure this was very informative for me. I have to admit that I would looooove to try that 1972 Giulio Ferrari Riserva del Fondatore – well, the man can dream, right? I didn’t have any new wines to taste to leave you with some tasting notes, but if this conversation made you thirsty, here are the links to my older posts about Ferrari Brut Classico and Ferrari Perlé. Cheers! Have you ever caught yourself using the same expression over and over again, to the point of being annoyed with oneself, but not been able to do anything about it? One of my expressions, pretty much a single word, is “beautiful”. Yes, of course I mean it in the wine context. The best case scenarios include the first “wow” once your nose encounters the aroma exuding from the glass, connecting to the “wow, this is beautiful” after the first sip, when aroma and bouquet altogether transform into a beautiful (oops, sorry), memorable experience. Yes, I know, reading the wine reviews consisting of “wow, this is beautiful” notes is somewhat pointless, and if it draws your ire, feel free to take it out in the comments section below – but I have to say it when it happens. The wine I’m talking about today was exactly like that. I got this bottle from a friend back in October. The wine is made by his father in Sicily – a small family production, for all I understand. One consequence is the fact that there is no information available on internet – and the bottle doesn’t have a back label, so I can only share my impressions. But – it was a beautiful wine. 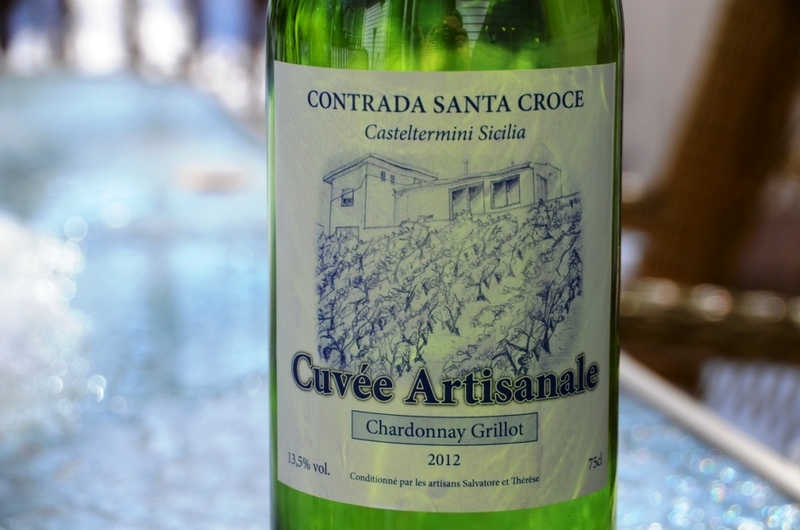 The color of this 2012 Contrada Santa Croce Casteltermini Sicilia Cuvée Artisanale Chardonnay Grillot (13.5% ABV) was intense yellow with an orange hue – I don’t think the wine was aged in oak, but it was definitely fermented on the lees, and probably was aged on the lees for a good few month, to have such an intense color. It was also showing a bit cloudy in the glass – I can assume it was unfiltered. And then there was was the nose. You know, that aroma which you can commonly pick up on many wines from Sicily – the volcanic soils, the touch of sun and minerals, inviting and promising, with hint of lemon zest. And then the palate. Totally unique. Starting from light, dry, almost effervescent midpalate feel. Then showing mature fruit, apricot and apricot pit, finishing with mouthwatering acidity, prickling sides of the tongue with fresh lemon notes. One sip inviting another. Until the wine is gone, and you are left with the memory. Let’s drink for the beautiful wines and people making them. Cheers! We are continuing our grape trivia series, with the focus again on the red grapes, and today’s subject is Barbera. Barbera is one of the main grapes in Piedmont, where it is often planted right next to its noble neighbour, Nebbiolo. Typically Nebbiolo takes over the best spots on the hills, and Barbera is planted right under. Some of the best Barbera wines are produced in Asti, Alba and Monferrato areas in Piedmont, with Barbera d’Asti and Barbera del Monferrato having the DOCG status (highest quality standing in Italian wine classification). Of course Barbera is planted in many other regions in Italy, such as Lombardy, Emilia-Romagna and others. Barbera spread out all over the world with Italian immigrants, nowadays planted in Australia, United States (California, Texas and others), Argentina, Brazil, Israel and other countries. Barbera grapes have dark thin skin. Barbera has a well known tendency for overproduction, so the plantings have to be controlled to achieve higher quality of the wines. Barbera typically has high level of acidity and low tannins, which makes winemaking somewhat challenging to produce wines which will be able to age well – of course ageing in the oak barrels helps with that. One of the well known characteristics of Barbera wines is intense berries aroma, and the wines typically have a medium body, at least in the classical Italian versions ( some of the New World Barberas can be quite bombastic). Barbera wines are generally food friendly with their inherent acidity, and they complement quite well a wide range of traditional Italian dishes. Q1: Based on the latest DNA analysis, which well known Spanish grape appears to be a close relative of Barbera? Q2: What well-known grape became popular blending partner of Barbera as of late? Q5: Fill in the blanks: Barbera typically ripens two weeks later than _____, but at the same time it is two weeks earlier than ____. About two month ago (yes, I know, I’m the speedy one) I was invited to participate in the virtual tasting. The subject – Italian wines. To be more precise, the wines from Umbria, made out of the grape called Sagrantino. I never participated in the virtual tasting before, so I was not sure how it was going to work. The idea was simple. I will get the wine, which should be opened and tasted in parallel with the winemakers, who will be doing it live on ustream. Of course I gladly agreed to take part in this wine drinking tasting. The subject was wines from Umbria, from the region called Montefalco. Actually, it was not just one tasting, but two – one for the wines called Montefalco Rosso, and the second one for the wines called Montefalco Sagrantino. It appears that Sagrantino is an Italian indigenous grape, which seems to be cultivated in Umbria for at least 500 years, if not longer. However in the 1960s it became literally extinct, and if it would not be the effort of the few winemakers, Sagrantino would be gone completely from the winemaking scene. Sagrantino has dark and very thick skin, which results in very tannic and concentrated wines, literally black in color when young. 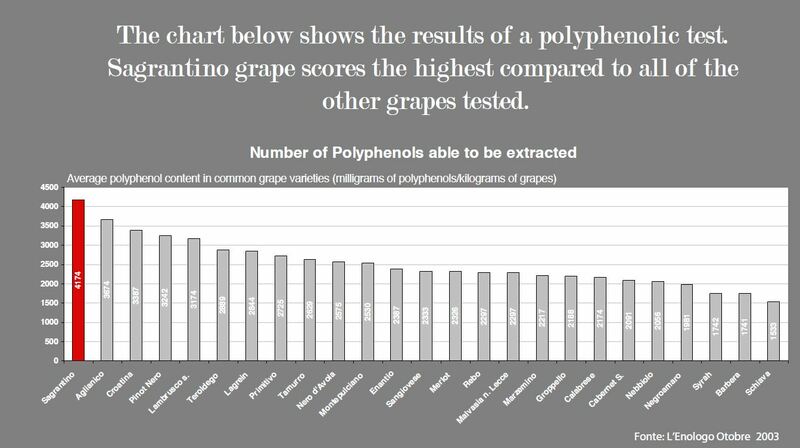 Sagrantino has the highest polyphenolic content among most of the red grapes, if not among all red grapes in the world (take a look at the chart below). Just to get technical for a second, polyphenols (also called phenolic compounds) is a large group of chemical compounds, responsible for color, texture and mouthfeel of the wine (think tannins! ), and the group also includes medically beneficial elements, such as reservatrol. As usual, I have to refer you to Wikipedia for additional reading, but I hope you get the point here. My wines arrived few days before the tasting. As luck would have it, the day which the wines spent on the UPS truck, was one and only day in September when temperature outside reached 96F (extremely atypical for Connecticut in September). When I took the wines out of the box, I could feel that they are quite warm – on average, my wine thermometer showed all the bottles to be at around 84F, so I was obviously concerned… I opened a number of bottles the next day, and to my big relief, the was no sign of heat damage (I quickly closed the wines back using the gas canister) – I was ready for the tasting. At the specific time, the ustream broadcast started with live tasting, where the panel of winemakers from all 5 wineries were talking about their wines and answering the questions. The ustream broadcast was accompanied by the live twitter exchange among all the participants in the tasting. The twitter stream was used to ask panelists the questions, share tasting notes and impressions. Definitely was interesting to see and hear the diversity of opinion both from the panel, and from the audience on twitter. To be entirely honest, the most difficult part was to do a few things at once – taking my own notes, talking to the people on twitter and listening to the panelists – difficult, but well worth it! 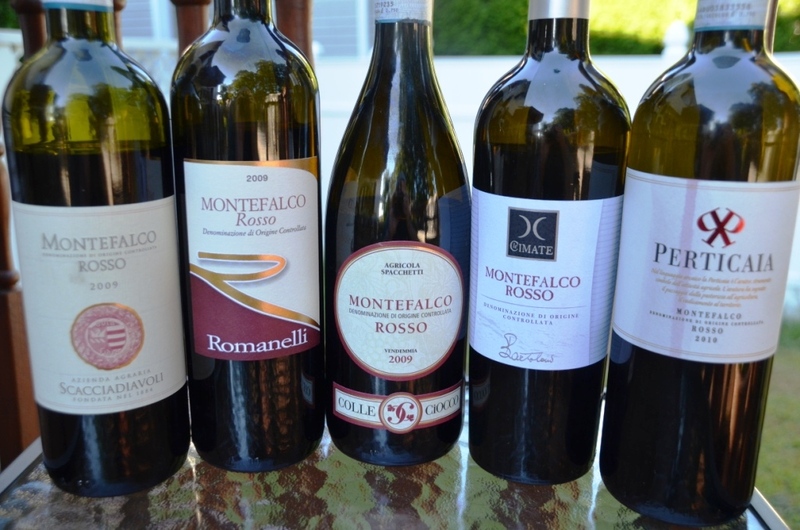 Below are my notes for the 5 Montefalco Rosso wines we tasted (as you will see, not necessarily taken exactly during that live tasting session). The next day we had the tasting of Montefalco Sagrantino wines. Montefalco Sagrantino wines are made out of 100% Sagrantino grapes. The tasting was done in the same format – panel of winemakers discusses the wines live via ustream, and twitter followers taste and discuss in parallel. It was recommended to open wines one hour before the tasting. Considering how massive those wines are, I would think the right suggestion would’ve been to open them in the morning. I don’t know if it could make the difference, but I have to admit that my experience was rather frustrating during the live tasting. 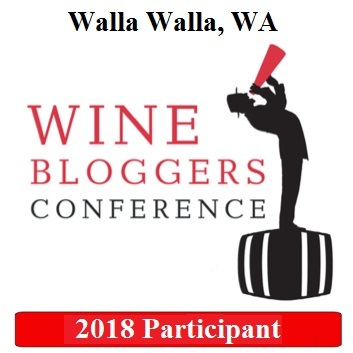 For the most of the wines, I couldn’t get any of the flavor descriptors and impressions, compare to what was exposed by the other twitter tasters. For instance, Arnaldo Caprai was showing literally as corked, where the other tasters had violets, black tea and other nice things to say. Literally only one or two wines cooperated with me during tasting. But – most of them came back nicely right after (see the notes). Below are my notes for the Montefalco Sagrantino wines (all wines are 100% Sagrantino). 2008 Colle del Saraceno Montefalco Sagrantino DOCG (14.5% ABV, 12 month stainless steel, 12 month French oak barriques, 6 month in the bottle) – this wine unfortunately showed signs of the heat damage. N/R. All in all, this was a great experience. The virtual tasting format was pretty well done, and I definitely will be looking forward to more virtual wine tastings in the future. 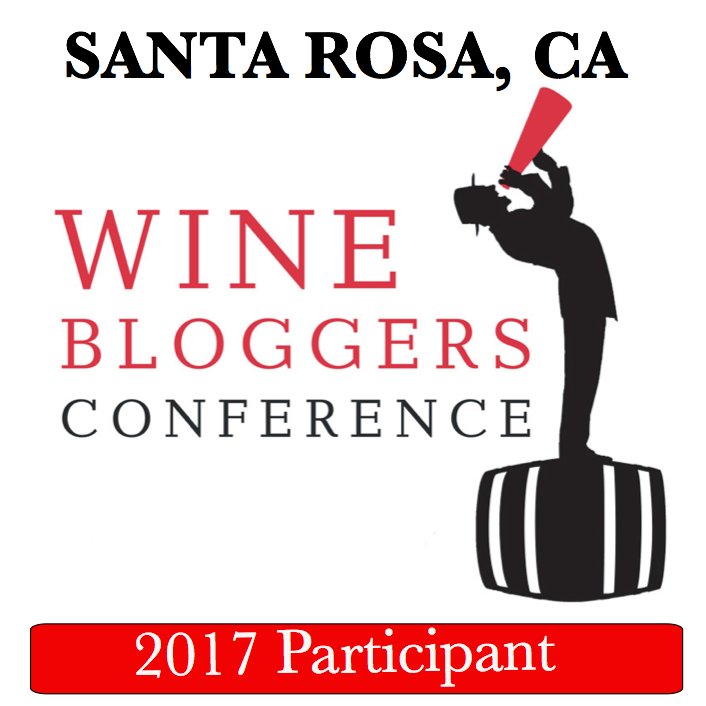 And for the wines – my notes are above, and I definitely recommend looking for Montefalco wines – both Rosso and Sagrantino well worth your attention. Cheers! Disclaimer: The wines were provided complementary by the PR agency. All opinions are my own. Welcome to the weekend! 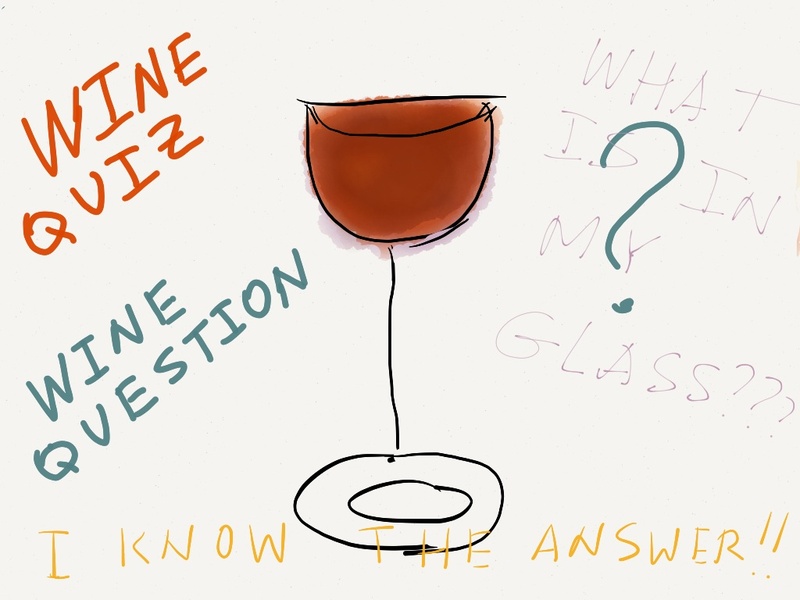 Your new wine quiz has arrived. Today our subject is the Italian grape called Nebbiolo – a power grape of Piedmont, solely responsible for some of the world’s best wines, Barolo and Barbareso. As I’m working on this series of quizzes, I’m of course learning a lot myself. It was very interesting for me to realize, that unlike any other major red grape we talked about so far, Nebbiolo is pretty much confined to the 6 or so areas in Italy, where it makes wonderful wines – its world-wide spread is non existent, not even in the form of clones, like Zinfandel. And this is all despite the fact that Nebbiolo is quite an old grape, with first mentions going all the way back to the 13th century. Nebbiolo is a very tricky grape to work with. It has the longest ripening cycle out of many grapes – buds early, ripens very late, prone both to mutation (there are about 40 known clones) and grape diseases. But – the resulting wines, like Barolo and Barbaresco, clearly worth the trouble, with wonderful aromatics, power and concentration. Also the ageing potential of the Nebbiolo wines is almost unlimited. Q2: In one of the regions outside Piedmont, the wines are produced from Nebbiolo grapes in the style of Amarone – with grapes drying on the straw mats before they are pressed. Can you name that region? Q3: True or False: Blending is not allowed for any of the wines produced from Nebbiolo grape in Piedmont region. 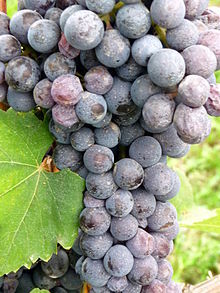 Q4: White grape used to be such a traditional blending partner for Nebbiolo that it was sometimes called White Barolo. Do you know the name of this grape? Q5: In the blind tasting setting, the wines made out of Nebbiolo can be very distinguishable even before you take a first sip. Do you know what is this distinct feature of Nebbiolo wines? Good luck, enjoy your weekend and cheers!